The chemical spill into West Virginia’s Elk River, which left more than 300,000 people without water for over five days (many are still without water), comes in a state with a long history of lax regulatory standards over the coal and chemical industries that form a major part of its economy. The chemical spill is yet another example of how lax regulations are setting the stage for disasters, and the concerns are being felt all the way in Texas. The chemical at the center of this disaster is 4-methylcyclohexane methanol, also known as MCHM, and it is used to wash coal. 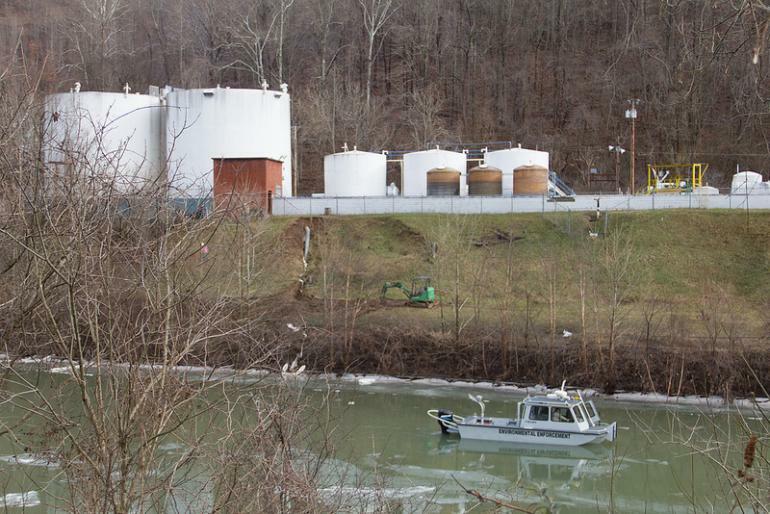 About 7,500 gallons of the chemical leaked from a storage tank, owned by Freedom Industries, and into the Elk River. The leak happened about one mile upstream from the West Virginia American water plant, which supplies drinking water to the local population. State officials are urging citizens to use bottled water for drinking, washing and cooking. Authorities say that at least ten people have been admitted into three hospitals, and 169 patients have been released from emergency rooms. Although MCHM is considered toxic, it is not lethal to humans. The effects on humans range from skin irritation, nausea, vomiting or wheezing. West Virginia Governor Earl Ray Tomblin declared a state of emergency for nine counties, including the state capital of Charleston. President Obama also issued an emergency declaration. West Virginia has received water from the Federal Emergency Management Agency (FEMA) and Department of Homeland Security (DHS) for its residents. It may be days before the water is safe enough for anything other than flushing a toilet or firefighting. Authorities are waiting until the chemical level meets 1 part per million, set by the federal Center for Disease Control and Prevention, before they lift the ban. The coal and chemical industries, which make up a large part of West Virginia’s economy, exercise great political influence in the state. They have long railed against federal safety, health and environmental standards. The West Virginia chemical spill is yet another example of what can go wrong when you have an inept polity that is influenced by big business. Texas also suffers from a similar affliction as West Virginia, except in addition to coal, we also have the petroleum and chemical industries. Texas has had its fair share of industry related disasters. An explosion last April at the West Fertilizer Co. in West, Texas killed 15 people. In 2005, an explosion at the BP refinery in Texas City killed 15 workers and left 170 others injured. With the West Virginia chemical spill making national headlines, let us remember that this kind of disaster is preventable. What we need is stronger safety standards and improved enforcement to make for a safer environment. Sign our petition asking EPA to improve chemical safety and protect our communities.